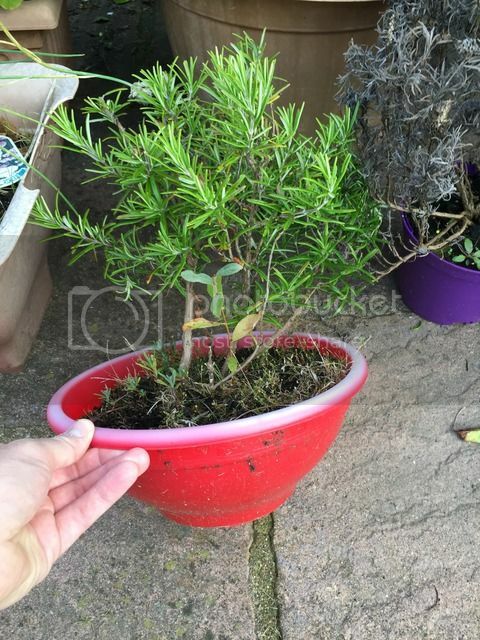 Posted: Mon Oct 26, 2015 11:12 am Post subject: repot rosemary? I moved to a new house and the previous owner had a rosemary plant in the garden, in a very shallow pot. Would it be better to repot this plant into a larger pot? It would be much better off in a large pot, in a gritty compost like John Innes no.3 or you could plant it somewhere sunny and well drained. Thanks Good Guy - would now be a good time to repot? Either would be old. Rosemary is tough as long as it is in well drained soil and it can grow into a large mosh bush. Why not do as Margo suggests and give it some growing room. The flowers are lovely in June. I would take out the seedling first ! Absolutely! And if in doubt about the drainage, dig in a couple of shovels of gravel before you plant it - they most Mediterranean herbs don't need good rich soil. They need free drainage and plenty of sun. You can arrange the drainage......! Thanks everyone - will have a think about pot vs. garden.